When treated with a peroxyacid (RCO3H), ketones can be converted into esters via the insertion of an oxygen atom. This transformation called the Baeyer-Villiger oxidation. 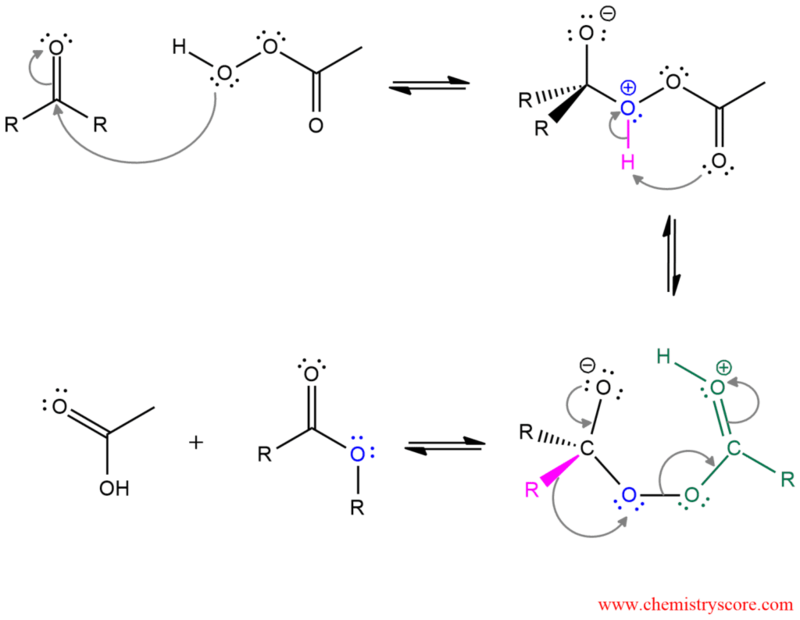 The mechanism of this reaction starts by nucleophilic addition of the hydroperoxy group of the peroxy acid to the carbonyl group. Then a proton is intramolecularly transferred from one location to another (rearrangement – H shift). The intermediate which is formed is unstable and decomposes through a cyclic transition state. The ester is obtained by alkyl rearrangement in which an alkyl group shifts from the original carbonyl carbon to oxygen. Treatment of a cyclic ketone with a peroxy acid yields a cyclic ester or lactone. The Baeyer-Villiger oxidation with an unsymmetric ketone is regioselective and is conditioned by the migratory aptitude of substituents. Some substituents migrate more easily than others. So a hydrogen atom will migrate more rapidly than a tertiary alkyl group, which will migrate more rapidly than a secondary alkyl group or phenyl, then primary alkyl group will migrate more rapidly than a methyl group. Migratory Aptitudes in the Baeyer-Villiger Oxidation: H > tertiary > secondary ∼ phenyl > primary > methyl.